George Henry Hatcher emigrated from England in the first decade of the Twentieth Century. He worked briefly for Millers Florist before opening his first florist shop at Avenue Road and Dupont in 1909. His clientele lived in that area and included Lady Eaton and Billy Bishop. He later opened a second store on the west side of Yonge Street, south of St. Clair Avenue. George and Dorcas Hatcher had four children: Jeanne Elizabeth, Margaret Louise, Bernice Eleannora, and George Ross. Bernice worked in the store part time. During WWII Ross Hatcher flew out of Great Dunmow as a bomb aimer with the R. A. F. Ross and the crew dropped supplies to the resistance in parts of Scandinavia. His tour of duty complete, Ross came back and started to work full time with his father, Bernice, and Miss Edwards. George Henry Hatcher died in 1950. He had a heart attack while making a wedding bouquet. His wife, Dorcas, and sister-in-law, Gladys, were present. In 1957 when Toronto widened Avenue Road, Ross moved the store to 4918 Yonge Street in Willowdale. 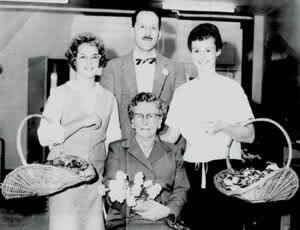 Ross' Mother Dorcas and two of his sisters, Jeanne and Margaret, worked with him at the new location. Ross continued to work in the store until 1972 when he died from leukemia, November 11th 1972 at St. Michael's Hospital. After Ross Hatcher died, his wife, Isobel and two of his sons, Bob and Doug, took over the family business. Isobel Hatcher died in March of 1998. Isobel graduated as a nurse in 1944 from TGH. Doug and I are honoured to carry on as third-generation florists. We greatly appreciate and respect all the hard working, wonderful people that have made Geo. Hatcher Florist the great florist shop that it is today. Order locally from a local expert. We know North York and Toronto. Forget the out of town order gathers.